Posted 16 December 2014 & filed under 17th century, 18th century, 1920s, 19th century, Agriculture, Footpaths and stiles, Middle ages, People, Places and spaces, Streets, Tudor period, Work. 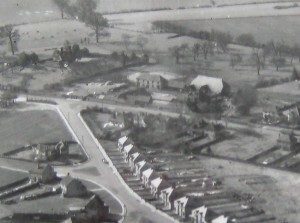 There used to be a farm in Watling Street called St Julian’s Farm The farm buildings were opposite the entrance to Vesta Avenue and can be seen in this photo which was taken in 1939. This land in Watling street originally housed a leper hospital which existed from the twelfth to the sixteenth centuries. It was called St Julian’s. Following the dissolution of the monasteries in the sixteenth century, the site of the hospital was granted to Sir Richard Lee. It remained with his descendants until 1649 when it was taken over by John Ellis who demolished what remained of the hospital and built himself a house, also called St Julian’s. One locally famous person who lived there was Henry Killigrew. He owned the estate from 1690 until his death in 1712. Henry Killigrew was an MP for St Albans between 1705 and 1708. By 1820 the farm and surrounding lands had passed down to William Wilshere and his descendants. An old medieval tithe barn, originally part of St Julian’s Hospice, became part of the farm. 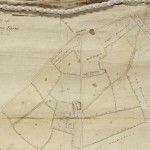 The farm lands were extensive and stretched to both sides of Watling Street and covered much of what is now the Verulam Estate. St Julian’s Wood was part of the farm. In the censuses of 1861 and 1871, John Gomme said he was the farmer of St Julian’s with an acreage of 370 acres and he employed fifteen men and four boys. In the two following census years of 1881 and 1891, the farmhouse is occupied by William Widdon, who describes himself as a stockman, and his wife. 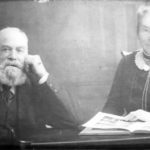 In 1901 and 1911 the farmhouse was once more occupied by the farmer, then James Varcoe but his father, Edwin Varcoe also farmed there for some time from 1906 until his death, in 1918, aged 80. Edwin Varcoe was born in St Dennis, Cornwall in 1839. His father James was also listed as a farmer. Edwin was described as a farmer’s son in the Cornish 1851 census. The farm covered 26 acres. As the years go by you can see in the census returns how their farm expanded. In 1861 it was 34 acres and 1871 it was 42 acres. In 1871 Edwin was listed as “Farmer” so presumably his father (James) had died. In 1864 Edwin had married Mary Jane Rowse in Bodmin. By 1881 their farm had expanded to 80 acres. Shortly after this the family left Cornwall and moved to St Julian’s Farm, St Stephens. The photo below is of Edwin and his wife Mary. The last farmer to farm St Julian’s was W.B. Muir. 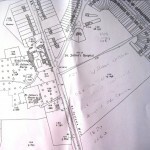 The Tithe map below left dates from around 1837 and shows part of the extent of the farm. The diagonal line which can be seen extending from the farm buildings towards the north east is a footpath which now follows the line of Vesta Avenue, Tavistock Avenue and Mandeville Drive and beyond. 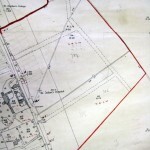 In the late 1920s a lot of the land on the east side of Watling street was sold off and St Julian’s Farm Estate was born. Eventually the farm and its buildings were demolished when the Tithe Barn estate was built. The Tithe Barn was dismantled and sent to the Chilterns Open Air Museum. I remember Muir’s Farm (that is what we called it) and have been inside the Tithe Barn as a child, the farm house there I remember had a duck pond in front of the building. The Tithe Barn was right next to Watling Street, I don’t think you could walk along side it without being in the road. I remember it being dismantled bit by bit for re-building some where else, now I know where. My grandad George willett worked for muirs farm. He used to walk the dairy cows where the estate was later built.